DeMar DeRozan showed lots of love for former teammate and mentor Jose Calderon before Toronto played in Dallas. Then the pupil one-upped his old teacher in the game. DeRozan scored 15 points, including the go-ahead basket on a wild shot while getting fouled in overtime Friday night, and the Raptors overcame a season high in points from Calderon to beat the Mavericks 109-108. Toronto trailed 108-107 after a 3-pointer by Calderon when DeRozan’s pump-fake got Brandan Wright and Shawn Marion in the air. DeRozan threw up a shot as he was bumped and it went in for the final points with 1:11 remaining. Kyle Lowry led six players in double figures with 20 points for the Raptors, who lost to Charlotte in overtime two nights earlier and were 0-3 in OT this season. "We understand what not to do from the previous one," said DeRozan, who led the Raptors with nine assists. Calderon led Dallas with 23 points, including 11 to go along with three of his nine assists in the fourth quarter, and was 7 of 10 from long range. "That’s just Jose, man," DeRozan said. "Jose seems like every time the ball leaves his hand the ball’s going in." But not on the possession after DeRozan’s go-ahead basket. Down by a point, the Mavericks missed three times in one trip in the final minute when Nowitzki misfired from 3-point range and Calderon was off target after the rebound bounced back to him beyond the arc. With a chance to reset, the Mavericks got the ball to Nowitzki again, but he missed a fadeaway jumper from the baseline. Nowitzki scored 22, but missed his last six shots to finish 10 of 22 from the field. "You know it’s going to be one shot, one stop, and I think we did the right things," said Calderon, who spent most of his first eight years in Toronto before a midseason trade to Detroit last January. "But we couldn’t make the last shot." DeRozan missed the free throw after his circus shot, but the Mavericks were off target on their last four, including a runner in the final seconds by Monta Ellis, who had 21 points and a season-high 11 assists. Toronto had its biggest lead at 89-81 when Calderon scored 11 straight Dallas points to get the Mavericks to 93-92. 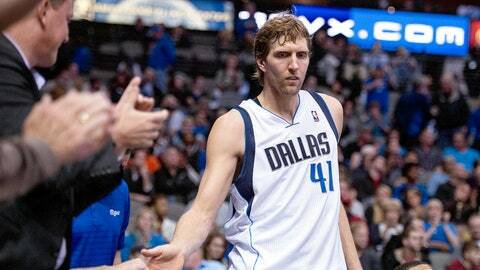 Calderon then drove and zipped a pass to Nowitzki for a 3-pointer to put Dallas in front 95-93. Calderon also assisted on Marion’s go-ahead basket with 20.9 seconds left, but DeRozan got Toronto even at 101-all with a tough jumper over Marion just 4 seconds later. Nowitzki missed a turnaround jumper with Amir Johnson defending just before the buzzer to end regulation, which included a 14-1 run by Dallas for a 41-22 lead followed by a 27-6 Toronto burst that put the Raptors in front 49-47 in the final minute of the first half. "It’s a PG rated show and I can’t really say it," Toronto coach Dwane Casey of his first-half message to his team in the building where he was an assistant to Dallas coach Rick Carlisle for three seasons. "Guys responded. They hit us with a haymaker, and I’m proud at the way our guys fought back." Toronto’s Jonas Valanciunas had 18 points and 13 rebounds, including a sequence where he rebounded his own miss twice and eventually scored for a 93-89 lead. Johnson and Terrence Ross scored 15 apiece for the Raptors, who started the fourth quarter on an 11-0 run. Greivis Vasquez had eight of his 14 points during the spurt, including a pair of 3-pointers on assists from DeRozan, who also hit a shot from long range. Ellis inbounded to Nowitzki with 2.9 seconds left in the third quarter, sped around Nowitzki as he got the ball back and hit a high-arching finger roll layup just before the buzzer to put the Mavericks up 81-78. The Mavericks had to fly to Phoenix after the game for their eighth back-to-back of the season and third game in four nights after they had a three-day break between a pair of home games. "It went wrong in the first half," Carlisle said. "They chewed into the lead very quickly. It’s hard to build a 19-point lead in this league." Marion scored 14 points and matched Nowitzki with a team-high nine rebounds. NOTES: Mavericks G Devin Harris is now targeting a January return after a setback in his recovery from offseason toe surgery on his left foot. He has stopped basketball activities because of swelling. … Nowitzki needs 35 points to pass Alex English for 13th on the NBA’s scoring list.